Fermata D Aria represented the Chicago Metro Chorus at the Manteno Veterns Home. Performing the Armed Forces Medley they honored those brave men and women who served our country proudly. Luis is a spiritual, talented director who shares his gift of music freely with others. He is excellent at working with vocalists of all levels. 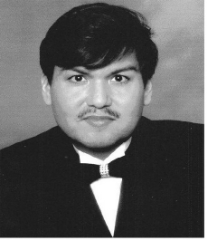 Luis is a phenomenal music teacher and is extremely talented as a musician with a wonderful tenor voice. He's endlessly patient with chorus members and has a passion for creating harmony and fun at rehearsals. We are so fortunate to have him join the Chicago Metro family as musical director. He is also the director of Music & Liturgy at St. Viator Church and faculty with The Community Music School at Columbia College. 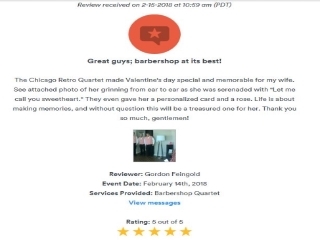 Traveling to Mount Prospect the chorus performed mainly holiday carols for the partons and staff of Search Inc. https://www.search-inc.org/. 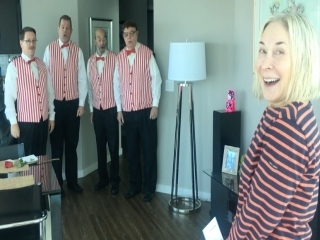 On Sunday' at noon the Chicago Metro Chorus and quartets performed at the indoor Farmers Market in the Jefferson Park Neighborhood of Chicago. Also performing on Ukulele and pedal bass.was chorus member Barrett Hazelwood..
Click for more information about hiring the chorus. 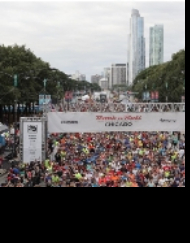 This is our 3rd apperance at the Rock N Roll Chicago Half Marthon this year held on Sunday July 22, 2018. Eleven early risers met on the corner of Madison and La Salle to perform "Retro Songs"of the 20's thru the 60's. Armed with just a pitch pipe the group performed a cappella in front of over 10,000 runners. Check out all six quartets during the first round. Video of Round One in order of appearance! !